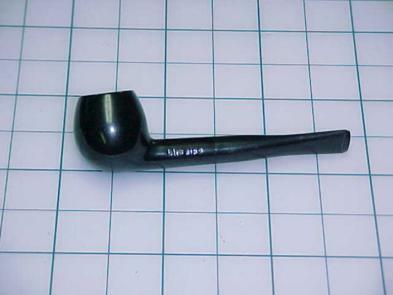 The value of pipe #204 is n/a points. Tom Colwell, who just by the way was elected Pipe Smoker of the Year at the Conclave of Richmond Pipe Smokers show in October, 1999, has been a loyal supplier of these pipes to me. I have no idea how he gets them all, but whenever I attend a show, Tom has some set aside for me. He is such a great guy and his prices are so reasonable that even when, as in this case, he offers me a pipe that duplicates others in the collection I just can't decline. This one went straight to the Pipes for Sale page. Michael Burke found the page and bought it from me.